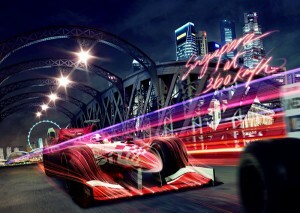 If your night is long and boring, why not try and see the Formula 1 SingTel Singapore Grand Prix? It will surely bring life to your evening. The rush it will give you is enough to invigorate your night. The Formula One night race in Singapore is the only one in the world. Many people come and see what it can offer. Don’t just stay in there, come and witness this thrilling and exciting activity. Last November 2007, Singapore Telecommunications (SingTel) announced that they will sponsor the race together with the Government of Singapore. The first race (2008) was held at the Marina Bay Street Circuit. It was the 15th round of the FIA Formula One World Championship. The race track has a length of 5,073 kilometres with 23 turns and 61 laps. Drivers should look out for the Turn 10 which is known as “Singapore Sling”. This is hard to manoeuvre and tricky. For the 2012 Singapore Grand Prix, Sebastian Vettel (Red Bull-Renault) won the race. Jenson Button (McLaren-Mercedes) came in next and the third is Fernando Alonso (Ferrari). For the 3-day group bookings grandstands, you can choose between -The Pit Grandstand (min of 4 for $1,888 each), Padang Grandstand (min of 4 for $498 each) and Bay Grandstand (min of 4 for $268). For the 3-day regular grandstands, you can choose between-Turn 1 Grandstand costs $1,288, Turn 2 Grandstand costs $1,288, Stamford Grandstand costs $698, Connaught Grandstand costs $698 and Esplanade Waterfront Grandstand costs $698. For 3-day walkabouts, you can choose between-Premier Walkabout costs $498 and Zone 4 Walkabout costs $228. There’s Single-day zone 1 special for $988. For Single day wheelchair accessible platform, you can choose between- Friday costs $48, Saturday costs $88 and Sunday costs $128.